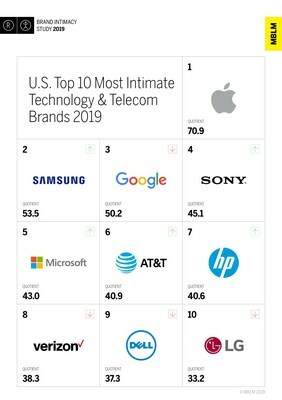 NEW YORK, March 19, 2019 /PRNewswire/ -- The technology & telecommunications industry ranked third in MBLM's Brand Intimacy 2019 Study, which is the largest study of brands based on emotions, climbing up one spot from the 2018 study. Apple ranked #1 in the industry for the fourth year, followed by Samsung and Google. The remaining brands in the Top 10 for the technology & telecommunications industry were: Sony, Microsoft, AT&T, HP, Verizon, Dell and LG. "With its presence and dominance in our modern day living, technology & telecommunications continues to build emotional bonds with consumers," stated Mario Natarelli, managing partner, MBLM. "Brands that are part of the smartphone ecosystem – device manufacturers, content providers, access brands and apps – have higher rates of Brand Intimacy than those that do not. Device manufacturers performed particularly well, which suggests hardware brands are benefitting the most from the increasingly important role that smartphones play in our lives." MBLM explored the tech giant Google in a piece released in conjunction with the findings, "What's Going on with Google?" The article delves into the Brand Intimacy profile of Google and its recent advances and setbacks. It discusses its Brand Intimacy performance, notably, its strong linkage to the archetype of enhancement and its success at connecting with millennials. In addition to the release of the findings and article, MBLM also hosted a webinar on the technology & telecommunications industry. A recording of the webinar can be found here. To view technology & telecommunications industry findings, please click here. To download the full Brand Intimacy 2019 Study or explore the Data Dashboard click here.